Who knew that little butterfly-shaped thyroid gland at the base of our necks could affect our lives so completely? Don’t underestimate the power of that little gland. It is the master control center for the metabolic functions of every single cell in your body. Therefore it has the power to disrupt every part of your body and to produce profound changes in every aspect of your life. Scientific research links hypothyroidism to heart disease, diabetes, kidney disease, gall bladder disease, liver disease, cancer, and Alzheimer’s. According to the World Health Organization, there are 750 million people in the world with thyroid dysfunction. Over half are presumed to be unaware of their condition. Despite research connecting an underactive thyroid to some of the deadliest diseases of our time, the hypothyroidism epidemic sweeping across the globe has gone largely unrecognized by the mainstream medical community. Are you sure you are ready for this long pathetic list of symptoms? My hope is that this post finds the millions of people worldwide who are not aware of their condition. They are suffering from multiple health complications but they have no clue their thyroid is to blame. Their doctors are prescribing medication after medication for illnesses that could be treated by addressing the underlying hypothyroidism. It is a tragedy. Then there are those who have been diagnosed with hypothyroidism and treated with thyroid hormone replacement medication, however they still suffer from many of the symptoms on this list. Their doctors have no idea the real reason for their ill health is the improperly treated hypothyroidism. They too are being prescribed multiple medications for conditions that could be treated by proper thyroid treatment. Others are mistakenly considered hypochondriacs and prescribed sleeping pills and anti-depressants by their doctors. Others are told their symptoms are just part of normal aging and shrugged off as unimportant. Doctors are relying solely on laboratory tests for diagnosis, not investigating fully the patient’s medical history, symptoms, family history and thorough physical exams. Does this sound like you? It may be time to change doctors. The following individuals and organizations are some of the top thyroid health experts in the world. My list of 300+ symptoms is a compilation of their lists of hypothyroid symptoms along with additional symptoms I have found in my research. Thank you to Dr. Mark Starr for the comprehensive list of hypothyroidism symptoms in his book H ypothyroidism Type 2: The Epidemic . Thank you to thyroid pioneer Dr. Broda Barnes for his thorough description of symptoms in the legendary book Hypothyroidism: The Unsuspected Illness . Thank you to thyroid patient advocate Mary Shomon for her extensive list of hypothyroidism symptoms in her book Living Well with Hypothyroidism: What Your Doctor Doesn’t Tell You…That You Need to Know . Thank you Janie Bowthorpe for her Long and Pathetic List of Symptoms. Thank you also to Thyroid UK for providing great resources. Every person will present with a different combination of symptoms. The severity of each person’s hypothyroidism will also determine the severity and number of symptoms they experience. Untreated hypothyroidism worsens with age with worsening symptoms. Don’t be led to believe that symptoms from this list are not connected to hypothyroidism, because they may be in your case, even if your doctor doesn’t know it. Are you prescribed medications for symptoms listed below? Are you sure your doctor is aware of the connection of these symptoms to hypothyroidism? Are you being treated with thyroid replacement medication but still suffering symptoms? Do you have a family history of thyroid disease, heart disease, diabetes, autoimmune disease, cancer and/or Alzheimer’s? Please read on. I told you it would be an unbelievably long list. Were you ready for that? What about Hypothyroid causing Tremors?? Not hyper o am talking about HYPO. 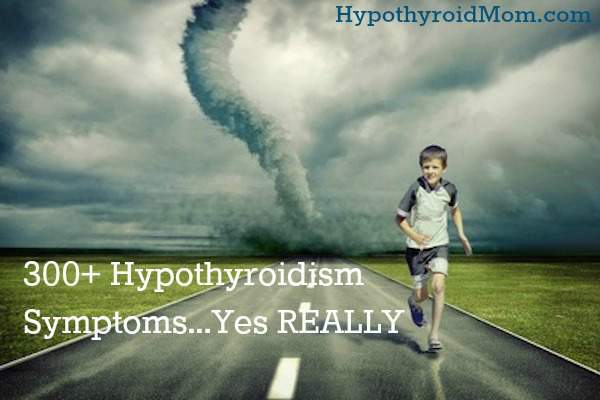 I have had tremors before I was diagnosed with Hypothryoid disorder. Also stiffness in back and neck. Gail, I am sad reading your comment. I am sorry to read about your son. I can’t even begin to imagine the pain of losing your child. I agree with you that change is needed in the way thyroid disease is diagnosed and treated. My own tough experience getting optimal treatment drove me to create this site. Good to have you here. You’re a peach. Why are you trolling, when the rest of us are simply looking for answers. I took your beautiful list with me to my Endocrinologist to discuss the fact that I’ve been suffering from almost every single symptom on this list for 35 years! His response was that most of the symptoms found on your list can be attributed to other illnesses as well and aren’t always an indicator of hypothyroidism, esp. when the hormone numbers aren’t supported in a blood draw. Help! What can I offer to combat his opinion? My numbers aren’t bad enough that he’s even concerned, but they are not normal (sadly, I forgot to write them down, so I don’t have them right now.) Thanks so much for your guidance. Hi Dina, I know it can be a real challenge to get doctors to hear you about your thyroid symptoms but please know there are doctors that get it. Of course there are many possible reasons for our different symptoms but if we have many of them then the thyroid should get a closer look. I wrote this article here and included studies at the bottom for the symptoms. Get a second medical opinion. Here are resources to help. I am trying to sign up for youe site, put my email and name and hit signed up but nothing happens? Re: autoimmune antibody, is tpo-ab needed to make a diagnoses of Hashimoto’s. What is the source that associates scoliosis with this condition? I’d like to share details and reference this on my blog. Can I ask how hypothyroidism contributes to irritable bladder and incontinence? Just wondering because my doctor doesn’t believe it is, despite my thoughts, and I don’t know how to go about treating it!!! Hi Jodie, Here are a few studies about the connections. Good to have you at Hypothyroid Mom. rhythm. I have around 80 to 85 of these symptom. I was wondering if you could give specifics about this article another words references. I am not having luck finding a doctor to give your article much credence..
Hi Robert, It is a real challenge to find a doctor who listens to you and your symptoms. Here in this article I include a comprehensive list of scientific studies at the end to back of the many symptoms of hypothyroidism.